This is what happens when someone who knows little about a subject gathers information - confusion. I have bits and pieces of information about Ford Motor Company cars and profits for 1905. Trying to put cars, profits and sales numbers together, this is what I've come up with. For Fiscal Year (FY) 1905, Oct 1, 1904 - Sep 31, 1905. Using the first table, I "prorated" the discount price and original price (to the best of my knowledge). For simplicity, I took 50% at the original price and 50% at the discounted price on models F and C. I also estimated Model B sales for 1905 at 430 cars. 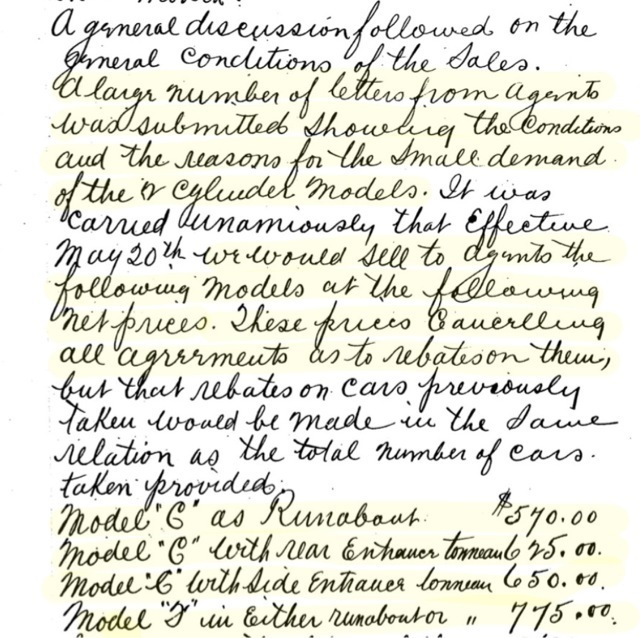 A total of 500 Model B were contracted by the board, and Trent Boggess ledger research shows a car in the 490s was sold, so I suspect 500 were actually produced). 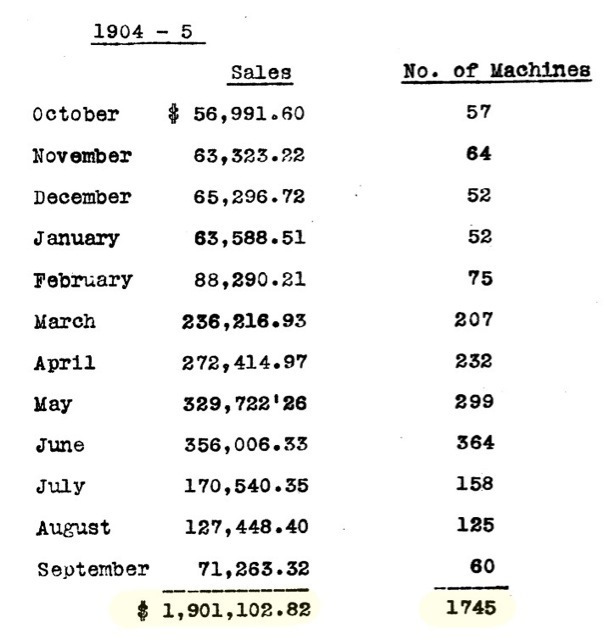 1905 was a profitable year for FMC (as was 1904) with large dividends being paid shareholders. It appears a large part of this success was due to the Model B. 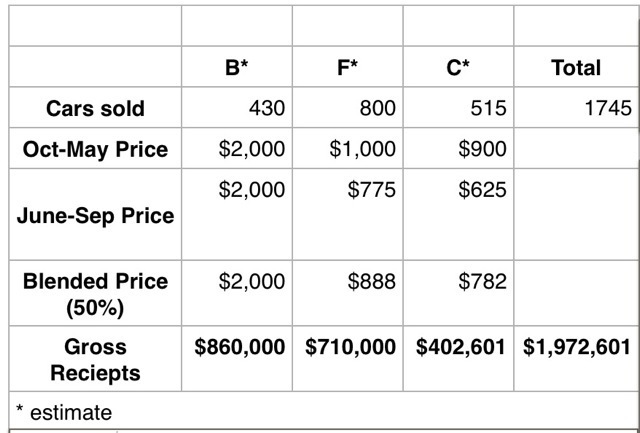 If my numbers are remotely close, the Model B was actually the sales leader in gross and net profit. If so, for two years in a row, 1905 and 1906, the "big" cars, models B and K, were the profit leaders for Ford Motor Co.. I intended to add a few things earlier. When "converting" to today's value, multiply by about 25. 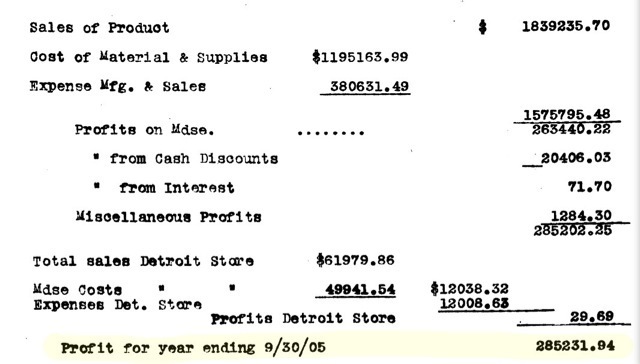 The report to investors also shows a "Dividends Paid" of $200,000.00. In todays economy, that equates to about five million dollars. Both Henry Ford and A. Y. Malcomson owned 26% of Ford shares each. Therefore, they should have each received about 1.3 million dollars in today's economy for their portion of dividends paid during FY 1905 (if my math is correct). A good year by most people's standards in dividends alone (with no income tax).